In the Upper Skiddavian (Upper Arenigian) strata of the Oslo region echinoderm remains are met with very rarely. Through the courtesy of Professor Leif Størmer the present writer has had the welcome opportunity of studying the small collection of such fossils kept in the Paleontological Museum in Oslo (PMO). 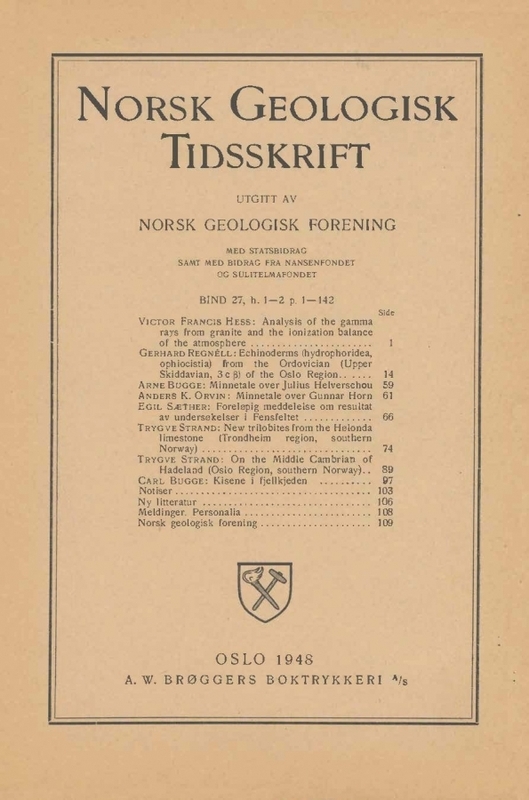 This collection comprises a very restricted number of specimens, but is nevertheless of considerable importance and interest for the knowledge of the Old Paleozoic echinoderm faunas in the Scandinavian- Baltic area, and also sheds some fresh light upon certain features of general interest. Four species of Hydrophoridea are represented, each of them belonging to a separate genus. There is, besides, a member of the Ophiocistia which has been designated as a new species of the genus Volchovia. The relationships of the different species are discussed in the descriptions below. As a result of this study it can be said that there is a clear affinity between the composition of this early Ordovician echinoderm fauna and that of the East Baltic area.